For a duo who first made a name for themselves when they were teenagers, the Söderberg sisters, Johanna and Klara, are remarkably grounded. Not for them the clichéd business of going off the rails, of succumbing to alcohol and drugs and all the other trappings of musicians thrust into the limelight while still so young. 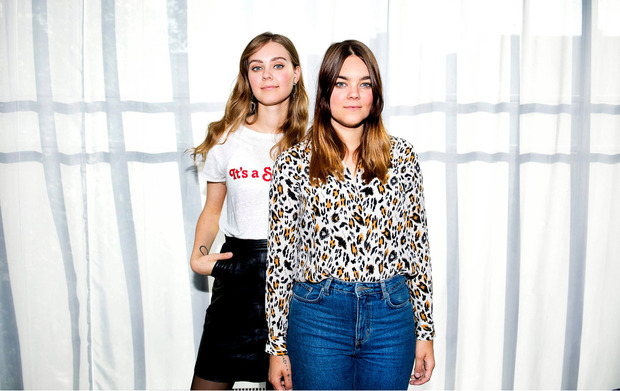 Klara was just 15 when First Aid Kit got noticed outside their native Sweden thanks to their marvellously raw and harmony-drenched cover of Fleet Foxes' 'Tiger Mountain Peasant Song' - which they had posted on YouTube - and Johanna was hardly a worldly figure at 18. But they laugh good-naturedly when Review wonders how they have managed to stay grounded. "I don't think it's difficult to be grounded," Johanna says. "Partly, it's because we are sisters and we know each other so well. I mean, when I'm looking at Klara, I don't think 'I'm sitting next to a rock star'. She's my silly little sister - she's still the same. "And we're not very cocky or braggy people. We don't consider ourselves to be above others and we never have. It's a Swedish mentality as well, this idea that you shouldn't walk around and think that you're better than anyone else. It's very ingrained in our culture - and it's very different to America, for example. They're very proud there, and they talk about how much money they have - that's the ugliest thing you can do if you're a Swedish person." Klara pipes up: "But that mentality [known as the Law of Jante across Scandinavia] is both good and bad… you should be proud of what you accomplish in life. It shouldn't be something you're ashamed of." First Aid Kit have a lot to be proud of. They have enjoyed international acclaim over the past decade - ever since Fleet Foxes' Robin Pecknold offered his seal of approval to their brilliant cover - and at the beginning of the year they released their fourth album, Ruins, which also happens to be their most ambitious. "When we made this record we talked to Tucker Martine, our producer, and we told him that we wanted him to surprise us," Johanna says. "We gave him completely free rein to do whatever he wanted." And what Martine wanted was to expand First Aid Kit's sounds significantly, to shift their thinking away from folk exclusively. "We definitely wanted to do new things," Klara says. "We're a lot more open to the creative process. We're open to trying different things. I remember when we were doing The Lion's Roar tour in 2011 and I was like" - here she adopts a mock-authoritarian voice - "'There shall not be any electric guitar on any of these tracks!'. We had this idea of pure folk music. For this, it was everything and anything - 80s synths? Cool. Electric guitar? Why not? Back then, I think we had to protect what we wanted to be, whereas now we trust our own ability and our songs, and if the songs are good enough, we can do what we want with them. We don't have rules any more - we just follow our own gut." Johanna says it's sometimes a tricky balancing act between trying new things and not alienating an existing fanbase, but she believes it's not wise for musicians to dwell on such issues for too long. "To be an artist for a long time and to have a long career is to figure out how much to change and how much to stay the same, but the key is not to overanalyse what you're doing, but to trust your instincts. "It's worked for us so far and I don't think this was a huge departure for us compared to what we had been doing before. Luckily, we have our voices and our harmonies and they sort of gel everything together. There's no way you can satisfy everyone. Some people are going to be disappointed if you don't change and others will be if you do change." Ruins features the guitar work of Peter Buck, who's been comparatively quiet since R.E.M. called it a day earlier this decade. "Tucker [Martine] is friends with Peter and he lives in Portland and he conveniently dropped by the studio for a few days and played," Johanna says. "We had met him before when we had done a cover of an R.E.M. song called 'Walk Unafraid' for the film Wild [starring Reese Witherspoon]." Buck had played guitar on that version. "We knew he was a great guy, but we didn't know he would end up playing on our album. And he played on virtually every song." Klara says one of the great benefits of being in a respected band is the opportunity to meet and to play with some of their musical heroes. The sisters speak to Review from the family home in Stockholm, but memories of their final US show from a fortnight ago are still fresh. They played the famed outdoor venue - Red Rocks Amphitheatre in Colorado - in support of Ryan Adams. "Since I was 12 years old, I've been listening to him," Klara says. "And we got to sing with him too, which was a dream come true. We've both been singing along to his records - as fans - for a long time and to be able to do it at that particular place was incredible." She says she sometimes has to pinch herself to know that the stunning career First Aid Kit have built up over the past 10 years is not a dream. "We never thought that we'd ever play outside of Sweden. Or outside Stockholm, even. Every single one of those shows in the beginning was remarkable in that someone had come to them. We couldn't get our heads around that! "And it's grown so gradually, in a really nice way. It's not like everything happened overnight. We're very appreciative of all the things that we do have - and we've had to work for it. And that was hard at times. But now it feels like a nice reward - to play a festival in Ireland, for instance. We couldn't have even dreamed that when we started off." Although both sisters speak English perfectly - and Klara, in particular, sounds like she's American - they say their native land strongly informs their music and their outlook, and they are proud to be part of a long lineage of Swedish acts who have enjoyed international acclaim. "There have been so many bands from here, like Roxette, Ace of Base and so on," Klara says, "so when you're growing up and you love music, and you want to play music, you realise that being from this tiny, little country is not a setback; it's a good thing - you can have big international success even if you are a little Swede. "And there's a culture of music in schools - you get lessons and you're encouraged to develop your talent. You get grants from the government to be an artist - and we got a lot of money from the government too so we could make our first record. And that sort of helps really makes a difference, y'know."